I was so excited about this book I went through two different websites trying to get an ARC and did a happy dance when I received it from Edelweiss! 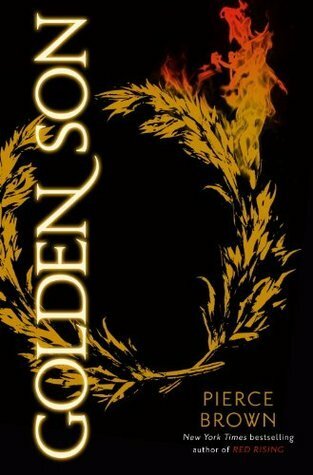 While reading Golden Son, I felt as if I were in a vacuum – nothing existed outside of this book – it was that captivating. Darrow’s story is both heartbreaking and horrifying and he performs some monstrous acts to accomplish the overall goal, but I was always in his corner. He’s as charming as he is wily and had some tricks up his sleeve that were pretty surprising. To say this book is full of action is an understatement. The body count is quite high, copious amounts of blood are involved, and some of the killing are very inventive, so it’s no wonder there’s such an extensive list of characters in this series – you obviously can’t kill the whole cast. Which brings me to my only issue with Golden Son. I read Red Rising almost two years ago and with such a large number of characters, I had difficulty remembering them and what they’d done. A short summary of the first book or character map would have been helpful. The world-building is just extraordinary, the characters deep and fascinating, and the storyline full of battles, betrayal, and power struggles with a little humor and romance tossed in. The Red Rising Trilogy is easily one of the best series I’ve read and you won’t find a sophomore slump in Golden Son. You don’t want to miss this. Golden Son is scheduled for publication January 6th, 2015. Another series for me to add to the TBR pile! I’d heard loads of good things about Red Rising, but didn’t get to that one either. I’ll be checking these out in the new year for sure! Last I saw, Red Rising was marked down to $1.99 since the new book comes out next week. Think you’ll really like it. I’ve been interested in this series. Now I know I want to read it. Thanks for the recommendation!